Benazir Bhutto (21 June 1953 - 27 December 2007) was a Pakistani politician. Bhutto was the elder daughter of Zulfiqar Ali Bhutto and Nusrat Bhutto (née Ispahani). Bhutto was the first woman elected to lead a Muslim state. She was elected Prime Minister of Pakistan two times. She was sworn in for the first time in 1988 but removed from office 20 months later under orders of then-president Ghulam Ishaq Khan on a belief that she was corrupt. In 1993 Bhutto was re-elected but was again removed in 1996 on similar charges, this time by President Farooq Leghari. 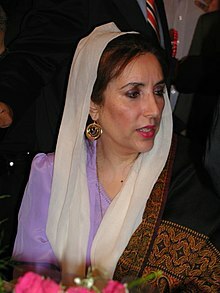 On December 27, 2007, Benazir Bhutto was killed while getting into a vehicle to leave a political meeting for the Pakistan Peoples Party in Rawalpindi, Pakistan. An assassin shot her in the neck and chest before detonating an explosive vest. This killed about 30 people and wounded many others. She is called Shaheed-e-Jamhuriat (Martyr of Democracy) by her fans. This page was last changed on 10 May 2016, at 14:08.